Continuing in their goal to seemingly make a new Link figure for every Legend of Zelda game going forwards, Good Smile Company are back again with Nendoroid Link: Breath of the Wild Ver. in both standard in DX Editions. While some are surely thinking “do we really need yet another Link figure?”, when it comes from one of the most popular Zelda games of all time and is based on a design that’s a significant departure from the usual one the answer is most definitely yes. Breath of the Wild Link is the third Link Nendoroid (following on from the Wind Waker and Majora’s Mask versions) and the sixth overall including the three Figma releases. It’s also the second to be released in 2017, coming only a few months after the release of Figma Link Twilight Princess Ver. Much like Figma boxes, Nendoroid packaging isn’t a particularly exciting affair – some boxes have their own individual flourish here and there but otherwise it’s a pretty uniform affair. 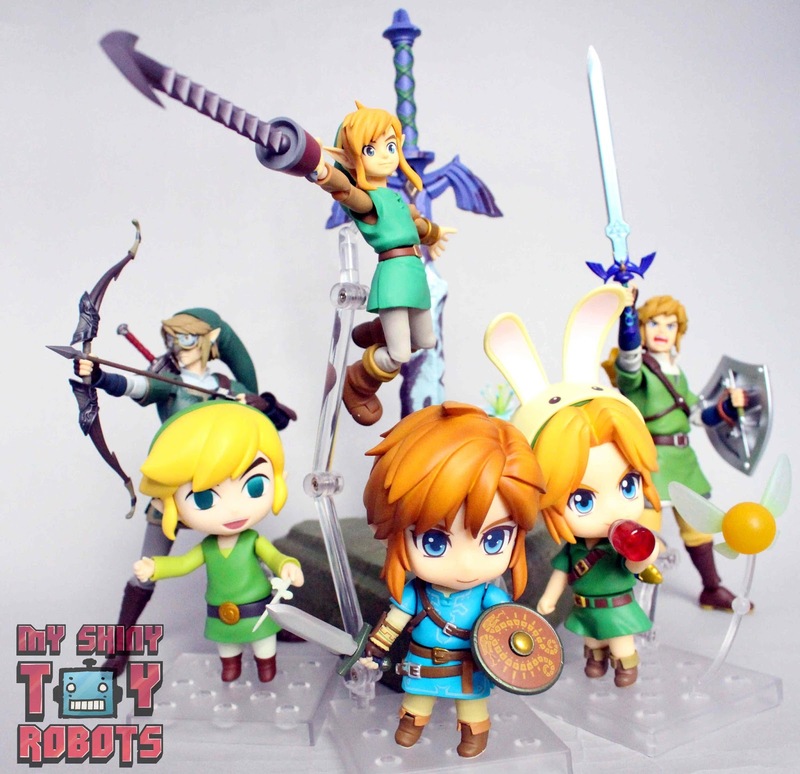 Link comes in a plain white and grey box, covered in various images of the figure and all its accessories (and with the amount it has there’s a lot to choose from). Inside the figure and accessories are mostly spread across a single plastic tray, with a smaller one tucked underneath that holds the alternate arm and leg parts. From the very first bit of concept art released Breath of the Wild immediately turned heads for its (long overdue) decision to take Link out of that iconic green garb he’s been wearing for decades and try something new. While the game itself had made Link’s wardrobe customisable, the iconic look for this version of Link is always going to be the Champions’ Tunic – a garment that can only be worn by someone who has earned the respect of the Hylian royal family. That’s the costume he wears on the box and all the promotional material, so of course that’s exactly the clothing the figure is going to adopt as well. Despite them all being practically perfect in their own ways the quality of these Link figures has noticeably improved with each release, and Breath of the Wild Link raises the bar once again. From the shading on his mottled, ponytailed hair to the incredible detail painted onto the Champions’ Tunic, this figure is just a joy to behold. The overall look and colours are quite unlike anything seen before on a Link figure, already making it wholly unique despite being the sixth version of the character GSC have produced between the two lines. While articulation isn’t a huge selling point with Nendoroids (and when it is it doesn’t always turn out that well anyway), Link still has more than enough to pull off some great poses. In addition to the Nendoroid-brand ball-hinge joints in the neck and legs, Link also has a waist swivel along with rotating shoulders and hands. For anything else, there’s a number of swappable arm parts included to get the job done. Link’s (sheathed) sword and shield can be carried on the figure’s back in typical fashion, however rather than plug directly onto the figure they instead plug directly onto an extended plug adapter on the included Nendoroid stand. This adapter is long enough to hold both the sword and the shield while still having plenty of room to fit comfortably into the figure’s back. The quiver however plugs directly into another hole located on the figure’s lower back, but the tab could have probably done with being a little longer. It isn’t especially loose, but it does have a habit of just popping off when handling to figure to repose it. The standard edition of Link comes packaged with an alternate shouting face, a selection of alternate arm, hand and leg parts, sword, sheath, shield, bow, arrow, quiver and the Sheikah Slate. Anyone who’s handled a Link figure (be it Figma or Nendoroid) will know exactly how the sword and shield work, with the sword featuring a removable pommel so that it can fit into Link’s hand securely as well as peg into the sheath. The shield features a ball jointed handle, as well as fitting into the hand in a similar way can also be posed and repositioned with ease. The bow and arrow are a little different to what’s come before though, and Good Smile have made some great changes to get a more natural looking archer pose. While the bow fits into Link’s hand in the usual fashion, the arrow pegs directly onto the bow as well as into the other hand. This not only means that the arrow is nice and secure, but there isn’t that obvious gap between the bow and arrow you sometimes get when the parts are completely separate. Finally there isn’t a whole lot to say about the Sheikah Slate other than that it’s a great game-specific exclusive accessory, which is something these Link toys really benefit from. But saying that, Good Smile have done a fantastic job at making this particular figure feel unique. There’s no Master Sword, no Hylian Shield – every piece included with Breath of the Wild looks completely unique and in line with the game’s aesthetic. It would have been easy for GSC to just stop at making Link’s clothes a different colour, but they’ve really gone all-out with this release. However if you choose to buy the DX Edition of the figure (and given the option why wouldn’t you? ), you get a wide selection of additional accessories all exclusive to Breath of the Wild. These include an alternate hooded head, axe, club and even a chicken leg for Link to snack on when he’s getting hungry. The hooded headpiece works just the same as a regular Nendoroid head so sadly can’t be lowered, but makes for a great alternate look that makes this Link stand out against the others all the more. The extra weapons are also a brilliant touch, perfectly capturing the “use what you can” mentality of the game by including the more unconventional club. The axe is a bit more in line with Link’s usual arsenal, but still makes a nice change from the typical weapons that appear in every game without fail. Just as the Twilight Princess Link was the Legend of Zelda Figma we’d all been waiting for in terms of accessories, Breath of the Wild Link has done exactly the same for Nendoroids. But saving the very best for last, the DX Edition also comes with an articulated, Nendoroid-scale horse which honestly has to rank as one of the greatest figure accessories of all time. It’s tiny, it’s adorable and best of all its even articulated. Being so small also means the articulation is manageable too, unlike the larger Figma horse which is a posing and balancing nightmare. With the support of the stand Link can of course right his animal friend, either holding onto the fabric rein or in the midst of attack while on horseback. The other DX Edition accessories are great, but this is the piece that REALLY sets this version apart from the standard release. Good Smile Company (and Max Factory as well to give credit where its due) have pretty much perfected the formula to the perfect Link figure now, so it’s no surprise to see that Nendoroid Link: Breath of the Wild Ver. is yet another winner. Just as the Twilight Princess Figma set a new standard for Figma going forward, this has done exactly the same for Nendoroids. Not only is it the most vibrant and unique looking Link released in either line so far, but it’s also beautifully sculpted and loaded with all kinds of incredible accessories. The only question now is when GSC are just going to outright drop the standard editions of these figures, because with them both coming out at retail and the minimal price difference one has to wonder why anyone would bother with the standard editions. After all, how can you say no to that tiny horse?